Everything you need to know and probably more than you want to know about kombucha. Kombucha refers to a fermented beverage produced from a mixture of steeped tea and sugar, combined with yeast strains and bacteria. Sounds yummy, right? Sometimes kombucha contains fruit juice or other flavors added during production. Kombucha can have an alcohol content of 0.5% or more if the sugar and yeast triggers fermentation. When the Kombucha has an alcohol content, then it is regulated as an alcoholic beverage by the TTB. If kombucha contains 0.5% or more alcohol by volume then it is subject to federal law and TTB regulations. Please note: If at any time during the production process the kombucha reaches 0.5% alcohol or more by volume then it must be produced on a TTB-approved premise and is subject to TTB regulation. 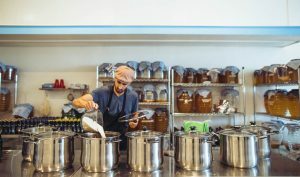 For example, a producer of a kombucha-style beer reaches an alcoholic content of 1.2% alcohol by volume during production must qualify as a brewer and comply with TTB regulations even if the finished product is a non-alcoholic beverage or it is later diluted down below 0.5%. Even though a kombucha beverage may be less than 0.5% alcohol by volume at the time of bottling, fermentation may still continue in the bottle after it leaves the production facility. So, the alcohol content may increase beyond 0.5% alcohol by volume. Also, the government has an interest in allowing taxes on alcohol-there must be some threshold for excise taxes because some kombucha can be much greater than 0.5%. *You can produce kombucha without qualifying with the TTB as long as the product never reaches 0.5% alcohol by volume or more during production, at the time of bottling, or after removal due to continued fermentation in the container. 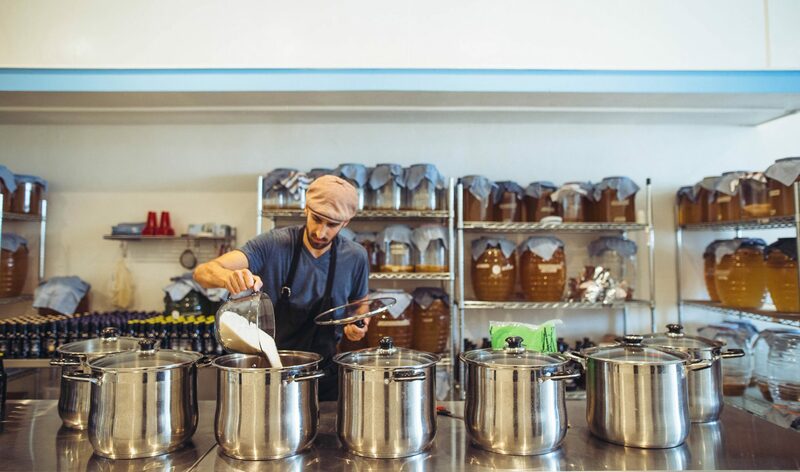 Usually, the classification of kombucha depends on its formulation and method of production. If the alcohol content of a kombucha product is 0.5% or more by volume, and the alcohol is derived from the fermination of sugar it’s generally classified as beer or malt beverage. Is the health warning statement required on kombuch containers? Yes, if the kombucha contains 0.5% or more alcohol by volume. What are the requirements if the kombucha I produce is classified as beer? If the kombucha is classified as beer, then you must qualify as a brewer and pay federal excise tax. A brewer must file a formula with the TTB before producing kombucha. Also, if your kombuch contains 0.5% or more alcohol by volume, you containers must have the health warning statement. What federal tax applies if my kombucha is classified as a beer? A tax will be imposed on all beer brewed or produced, and removed for consumption or sale within the US or imported into the US. A brewer also pays taxes on a barrel equivalency (a barrel is defined as 31 gallons of beer). How do I qualify as a brewer? You must file and receive approval of a Brewer’s Notice from the TTB. May I produce kombucha containing 0.5% or more alcohol by volume for my personal or family use without paying federal excise tax? Yes, you can produce a limited amount of beer for personal or family use and not for sale. You cannot exceed 200 gallons per year for households or two or more adults or 100 gallons per year if there is only one adult in the household. ****the photo on this post is from Fine Feathers Kombucha Company in California. View their website here.